This is the first example reported in this pattern. It is in amethyst and 17 inches tall. It sold in 2009 for $775. The auctioneer did not think it was American. 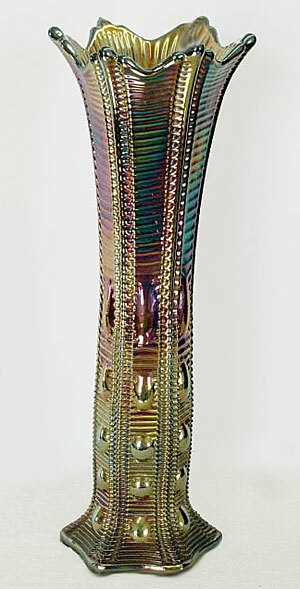 In 2012, another example of this unusual vase sold on eBay for $687. In 2012, without known attribution, many folks had reverted to the default of “possibly European. Others felt that the Giant Pagoda vase had significant Dugan characteristics — namely the edge points similar to Target and Paneled Tree Trunk vases; and the base shaping similar several Dugan vase patterns. In 2013, Mike Carwile, while searching through boxes of shards from the Dugan dump he had bought years before, came across some pieces that were obviously from a Giant Pagoda vase. So it would appear that, almost certainly, the vase was made by Dugan.